This week marks the last event in the Summer Concert Series (barring a rain out)*. The Midtown Horns are scheduled to play on Thursday, August 9th. The concert takes place from 6:00 – 8:00 pm at Neary School (53 Parkerville Road). The Midtown Horns is known for playing Classic Rock, Latin, Motown, Rhythm & Blues, and Soul. This week’s specialized food truck is Say Cheese, featuring gourmet grilled cheese sandwiches. And Uhlman’s will be selling ice cream from its truck. But you are always welcome bring your own picnic to the concert. 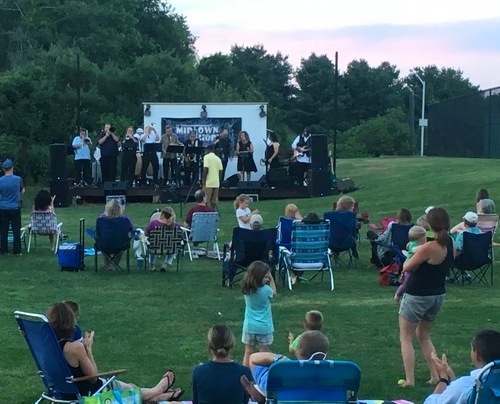 The music series is run by Southborough Youth & Family Services and the Recreation Department. 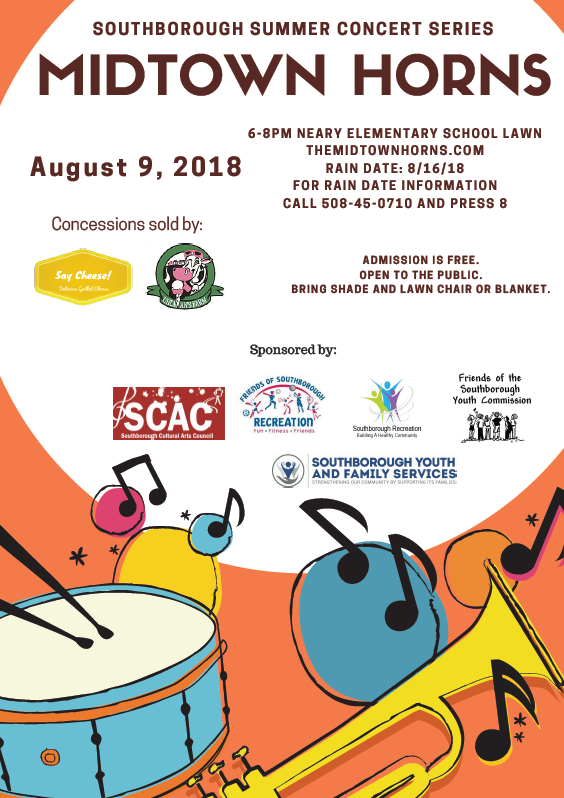 It is also co-sponsored by: Southborough Cultural Arts Commission, Friends of Southborough Recreation and Friends of Southborough Youth Commission. For this year’s fund raiser we are selling t-shirts which you can tie-dye on the spot (fun, fun, fun!) and coloring books featuring summer themed artwork by local artists (Southborough kids!). If you’re sad to see the series come to an end – it’s worth noting that there will be one more concert on Neary’s outdoor stage this summer. It’s just not part of this series. Save the date for Southborough Summer Nights on Saturday, August 25th. The end of summer bash will include live music as always. Stay tuned for more details on that. *The Rain Date is August 15th. I may update this post if the concert is postponed. But I don’t always have the ability to make a timely update. You can check out the status yourself on Thursday by calling 508-485-0710 and pressing 8. **If your family, like mine, was hoping that retired teacher Stephen Curtis would be returning to the stage with the band, sorry to disappoint. He won’t be performing this week.